For perfect hard boiled eggs, place the eggs in a pot with cold water and gently bring to a boil. When the water boils, cover the pot, turn off the heat and let stand for exactly 7 minutes. After 7 minutes, drain the hot water and rinse with icy cold water for a minute to stop the cooking and prevent a grey ring from forming around the yolk. When the eggs are cool enough the handle, peel them and chop them coarsely. Prepare a dressing by combining 1 cup homemade mayonnaise with the tarragon, chives and chevril. Season the dressing to taste with sea salt and freshly ground black pepper. 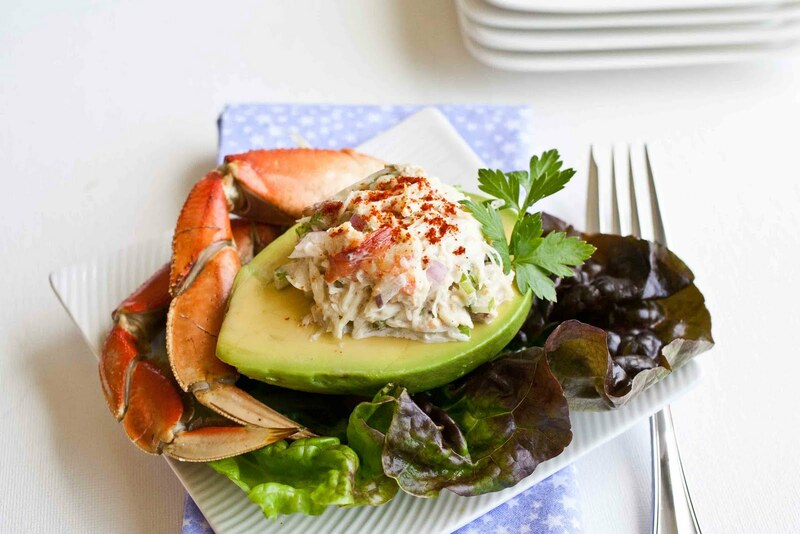 In a bowl, mix together the crab meat with the celery and season to taste. Add some homemade mayonnaise to taste and to moisten the preparation, season the mixture with salt and pepper and add a squeeze of lemon juice. Place the avocado halves on plates, fill the cavity with the crab meat mixture and top off with the chopped anchovies, olives and parsley. 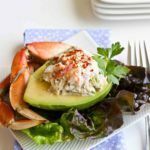 Serve with the herb mayonnaise on the side.